Our rural local high school has a strong student leadership group called Future Farmers of America. 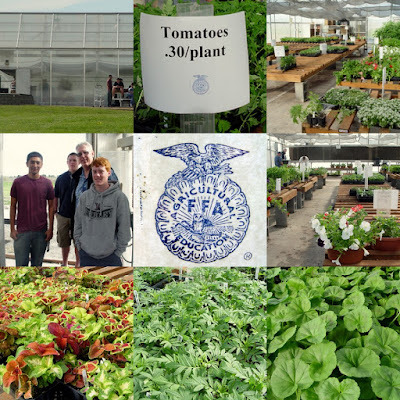 As one of the Vocational Clubs of America, it provides many opportunities for students in the agriculture program to gain hands-on experience and education in the plant and animal sciences, horticulture, forestry, and agrimarketing. FFA provides a place for students to practice their leadership skills and gain experience in supervised agriculture career experiences through business. Each year our local group has a two-day plant sale, just in time for spring planting. Enthusiastic students plant and tend to tomatoes, peppers, coleus, geraniums, petunias, pansies, dahlias, marigolds, and more. Their plants are well tended and healthy! Last Friday I attended their sale; it had been such a great success that they'd sold about 3/4 of their stock by the time I got there. Reasonable prices of thirty to fifty cents a plant attracted many from the local community and afar. Armed with four flats of beautiful plants, my work has just begun! Today tomatoes were planted --- tomorrow the rest.